Georgia and Russia are inching closer to a potential breakthrough on opening disputed borders to international trade. And they have natural disasters to thank for the progress. The two countries disagree bitterly on where the northern borders of Georgia lie, but they may shelve these differences for the sake of unblocking the Caucasus’s most persistent traffic jam. Moscow and Tbilisi have been making quiet steps toward letting trade pass through the isolated territories of Abkhazia and South Ossetia. In the most recent development, Georgia has set up an ad hoc commission to implement a long-stalled 2011 treaty on opening trade corridors through the two breakaway regions. Under the treaty, Georgia and Russia agreed to outsource to a Swiss company the task of monitoring trade across Abkhazia and South Ossetia. The new Georgian commission will work “to ensure effective implementation of” the contract with the Swiss company, Société Générale de Surveillance (SGS), according to the December 31 government decree setting up the body. Having a third party do the monitoring can help elide the thorny question of who does customs checks on the borders, and, hence, where these borders are. Tbilisi (along with much of the rest of the world) regards Abkhazia and South Ossetia as Georgian territories controlled by illegitimate, Russian-backed authorities, while Moscow recognizes them as independent states. As such, Moscow and Tbilisi have very different ideas where customs points should be. The decree on setting up the inter-agency commission, issued by Georgian Prime Minister Mamuka Bakhtadze, suggests that the Swiss company has already been paid for its future services, but it is unclear when monitoring of goods will start. The Georgian Foreign Ministry and Georgia’s special envoy for negotiations with Russia did not respond to Eurasianet’s requests for comments. Some news outlets in Georgia’s southern neighbor Armenia claimed that goods could start transiting through Abkhazia and South Ossetia as early as February. The agreement is of vital interest to Armenia, as it depends on Georgia for access to its main export market, Russia. Currently, Armenia’s only way to reach Russia by land is over the tsarist-era Georgian Military Highway, which threads through the Caucasus mountains north of Tbilisi to the Russian border. There are potential alternatives through Abkhazia and South Ossetia, but the dispute over those territories’ status keeps them closed to large-scale transit. The only thing that may precipitate the process is an emergency situation, such as a “landslide,” Vartanyan said. Although Russia and Georgia signed a general agreement in 2011 to work toward opening of these corridors, negotiations inevitably got bogged down in the status of Abkhazia and South Ossetia and the agreement was put on the backburner. 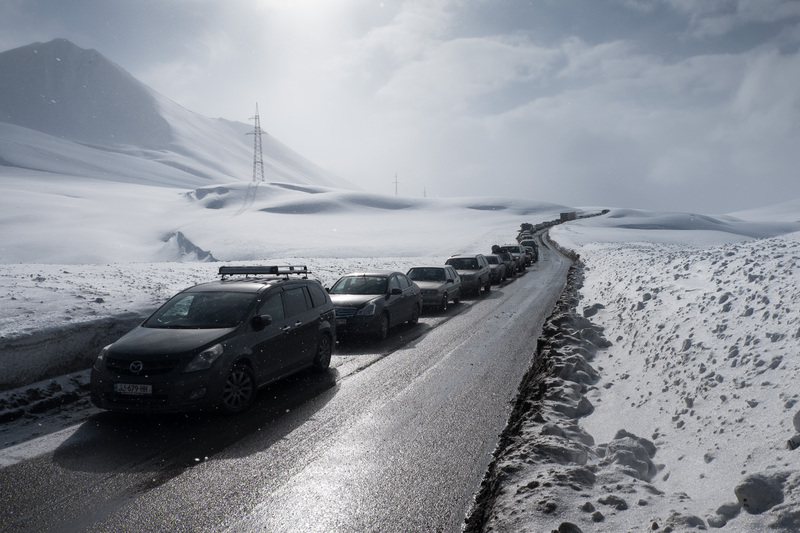 That meant that traffic remained limited to the single existing road, the Georgian Military Highway, where even on a good day long caravans of trucks from Armenia, as well as from Turkey and Iran, clog the way. 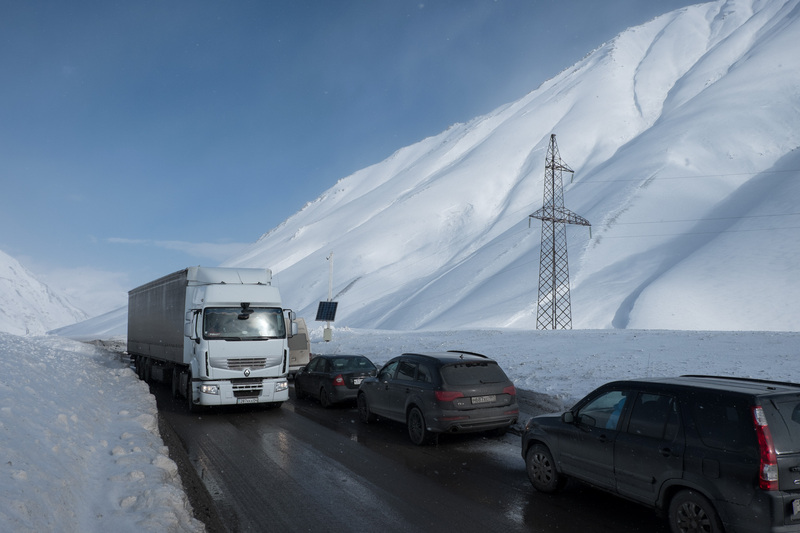 Trucks spend hours parked on one side of the narrow, two-lane road waiting for the oncoming traffic to pass, and the situation is made worse by heavy snowfalls in winter and occasional landslides. The situation is all the more vexing to Georgians since this is also the route to Georgia’s top ski resort, Gudauri. Trucks waiting for traffic to pass through the two-lane road. But in 2016, a landslide on the Georgian side of the border completely blocked the road for 10 days, and as a result breathed new life into the discussions over the Abkhazia and South Ossetia trade corridors. Truck drivers were left stranded and many of the perishable goods bound for Russia went bad. The Armenian government then asked Georgia and Russia to provide temporary passage through South Ossetia. Both Tbilisi and Moscow seemed open to the idea initially, but the dispute over the region’s status ultimately prevented a deal. Still, the landslide appeared to get the conversation on transit going again. A year later, Georgia concluded a contract with SGS and last year Russia followed suit. The final deal will likely hinge on disentangling the subject of trade corridors from the question of political status. 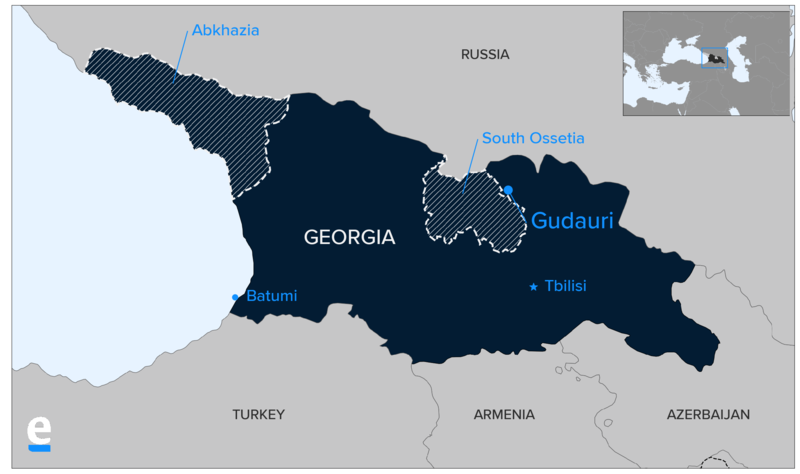 Economically, as well, all sides stand to benefit from having multiple trade routes connecting the northern and southern sides of the Caucasus mountain range. “That will boost [Russia’s] trade with Georgia, Armenia and eastern Turkey,” Thomas de Waal, a longtime Caucasus observer and Senior Fellow at Carnegie Endowment for International Peace, told Eurasianet. But politically it could be explosive. Georgian authorities would open themselves to domestic pushback if there is a sense that Tbilisi is compromising on the status of the regions. On the bright side, though, the corridors would open Abkhazia and South Ossetia to legitimate trade with Georgia proper. As it stands, very little trade trickles through the de facto borders and the two regions almost entirely depend on trade with Russia. “It would […] open South Ossetia more and make that region more than just a military base [for Russia],” de Waal said.